Jaguar’s Supercar-rivaling, supercharged XE SV Project 8 sets new track record to claim title, ‘World’s Fastest Four-Door’. Racer Randy Pobst, aka, The Rocket, lapped the 2.238-mile WeatherTech Raceway Laguna Seca in the 600 horsepower, 200-mph road-legal sedan in 1minute, 37.54 seconds. It was almost a second faster than the previous production sedan record! The most extreme Jaguar yet produced, XE SV Project 8 is a sedan with genuine Supercar performance. 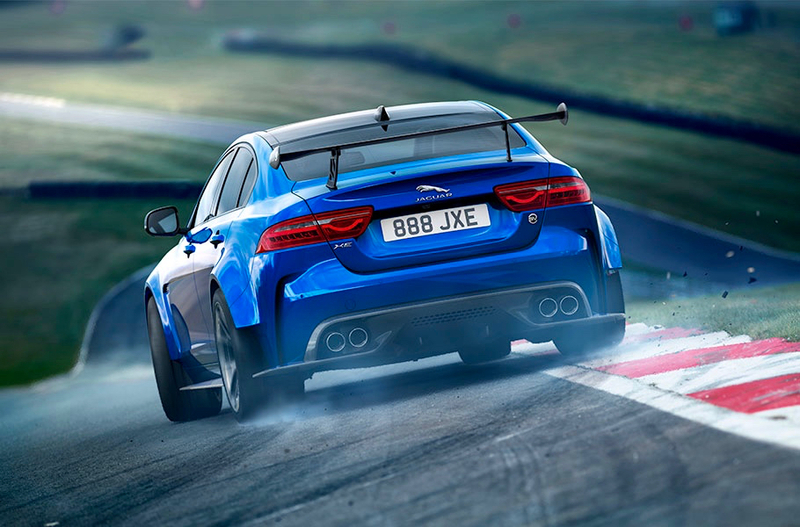 Jaguar Land Rover Special Vehicle Operations engineers have fine-tuned the car on some of the world’s most demanding test tracks, including Germany’s famed Nürburgring Nordschleife. Late last year an XE SV Project 8 lapped the 12.9-mile circuit in a record 7minutes, 21.23 seconds. 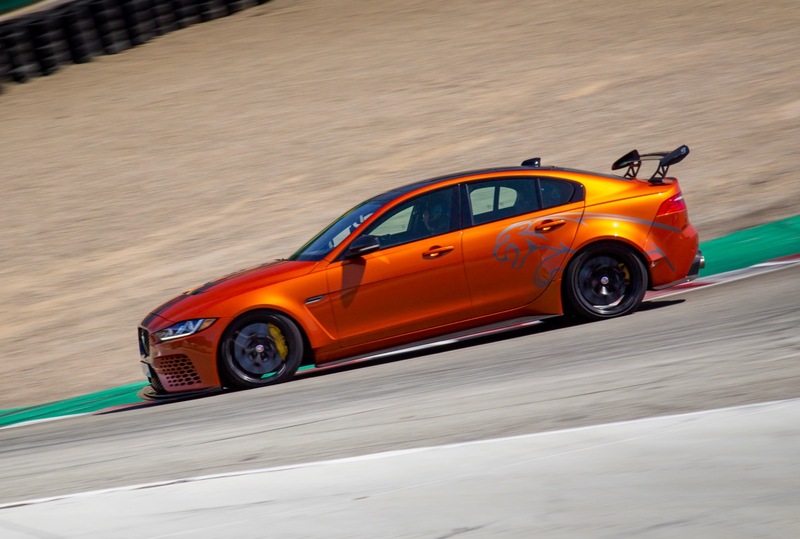 This Laguna Seca lap record set by Pobst, below, is another powerful demonstration of the Jaguar XE SV Project 8’s performance credentials. “Designed, engineered and hand-assembled by Special Vehicle Operations, this record-breaking sedan is made for the world’s most demanding driving enthusiasts,” said Michael van der Sande, Jaguar Land Rover Special Operations Managing Director. Project 8 is the ultimate expression of Jaguar’s XE sports sedan. While based on XE’s lightweight aluminum-intensive monocoque architecture, each of the 300 hand-built Project 8 XEs are modified at the SV Technical Centre in Coventry to accommodate the specially tuned, supercharged 5.0-litre V8 engine and a unique rear differential. Unlike most high-performance production sedans, the all-wheel-drive XE SV Project 8 is studded with genuine racing technology: F1-style ceramic wheel bearings, adjustable ride height and camber suspension. The front and rear fenders are bespoke to accommodate larger, wider, wheels that are necessitated by the larger brakes. The V8’s power is routed to all four Michelin Pilot Sport Cup 2 tires through an eight-speed ZF Quickshift automatic transmission for maximum performance. 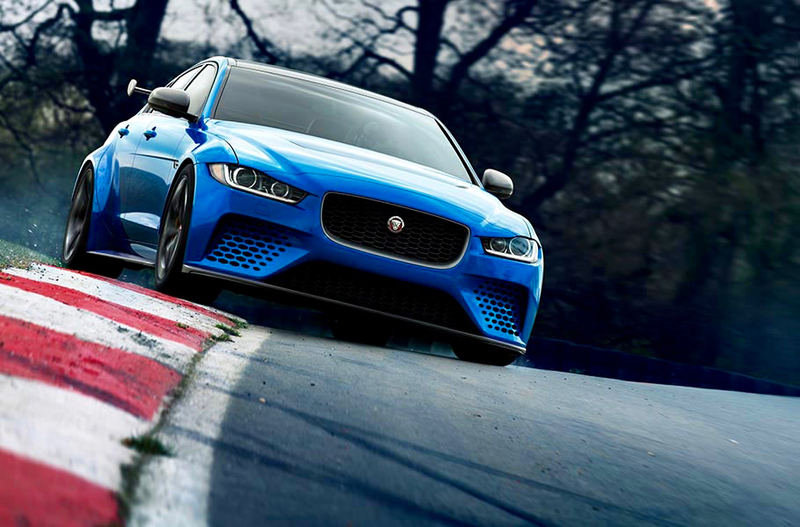 The XE SV Project 8 can sprint from 0-60 mph in 3.3 seconds and boasts an electronically limited top speed of 200 mph. In order to achieve this performance, the car receives significant aerodynamic and suspension upgrades, including a “Track” mode for maximum downforce and upgraded damping, throttle and steering response. Project 8 is available in two specifications. The standard four-seat model features Jaguar’s latest front Performance seats with magnesium frames, plus a more heavily contoured rear seat cushion to maximize support. The optional two-seat Track Pack includes lightweight front carbon fiber racing seats with four-point harnesses fixed to a harness retention hoop in place of the rear seat.